Being on a creative spree I have decided to finish my latest project, something which I had a hard time deciding what eventually is, until you people gave me a revelation. I present to you Mek Gitfixa on his deff-jetbike. This model has started as a project more than 10 years ago. Yes, you heard that right. It has been sitting on my bench on various stages for more than a decade. It originally started as a count as deffkopta, back when they were first introduced as a unit choice. I wanted to field some but it was impossible to find a model since the only alternative was the original gorkamorka model which was even then extremely rare and oop. I had always a great thing for conversions, especially orky ones. 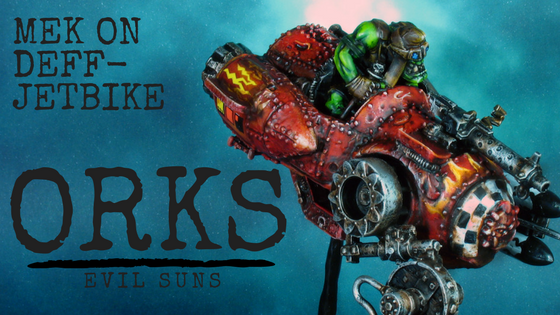 Orks were my very first Warhammer army and it really got me into modelling and converting all sorts of whacky vehicles and individuals. So I decided to rummage my bits box for suitable bits to create a deffkopta model to use in my games. The main model I used was an old Warzone jeep model (I really don’t remember what model though, I will make my research and I will edit this article so keep an eye on this space, unless someone out there finds out earlier so please comment below if you remember :) ). The jet packs are 2nd edition ork pulsa rokkits, the chainsaws in front are Catachan saws from the Catachan Sentinel set, Rokkets are from an 1:48 fighter jet kit and various bits from the ork boys sprue, including the Mek boy itself, with sculpted goggles to add character. There are various sculpted parts in the model to integrate all bits seamlessly in the final model. I went with a typical Evil Sunz paint scheme, staying true to the mythos that Red ones go fasta, a machine like this must definitely go faster than anything else this Mek has ever created, although it will probably kill him eventually. I have tried some flame patterns and checkers both freehand and transfers to add to the final orky-ness. Awesome work. The conversion is well executed, and the painting looks great. Such a cool model to add to your collection. It’s beautiful, and seems dangerously fast! I think most meks die by machines they have created, this looks like no exception. Great looking and with a crap load of character. 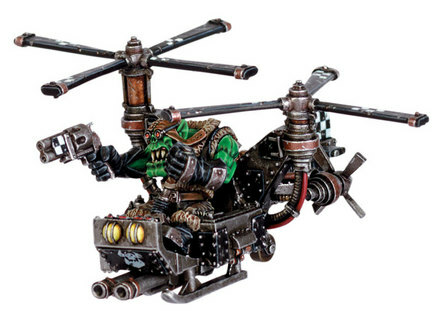 It’s miniatures like this that made me like the 40k Orks, weird, silly and just awesome. Thank you for your comment! I love character in a model as well and I have started collecting orks back in the glorious days of 2nd edition when space orks were a colorful bunch of banners, different clans and attitude. Thats what I am trying to recreate every time I start a project like this. I also started an Ork army back then. I lost most of it during the years but I tried to recreate it maybe 7 or 8 years ago, and make it more as I wanted it back when I started. So I made a Freebooter pirate themes army only using RT & 2nd Ed miniatures. I don’t think I’ve used it more than twice I think, but I still have it in a closet and I doubt I will ever get rid of them this time. Ah, a fellow ork player then! :) Luckily I have all my stuff preserved from back then, most are in a horrible state though, I may try to repaint some of them at some point. 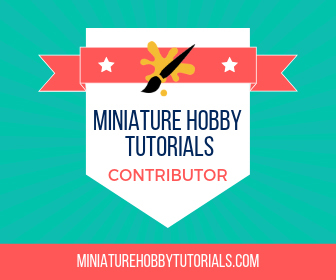 I just LOVE Freebooters, I have some of the original models that I will definitely paint, but keep an eye on my updates, Freebooter Flash Gitz are my current project. I will post an update on my blog, maybe today! That is fantastic – Great job! I like the combination of the model with the base. They work really well together. Thank you! I love making bases as elaborate as possible. I think that they give the model extra character, especially when they have a lot of free space.